The campers sleep in cabin style, Conestoga covered wagons, teepees or in cabins. The teepees have vinyl cots and the wagons and cabins have bunk beds with mattresses and electricity. Campers attending in August are encouraged to bring extra blankets due to cooler weather.  What is the food like at Circle Square Ranch? Circle Square Ranch has an experienced team of cooks who prepare delicious and nutritious meals during camp with a variety of healthy snack options at Tuck times. Campers with particular dietary requirements are encouraged to consult with camp prior to their arrival. 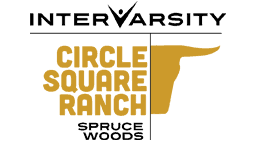 Circle Square Ranch is owned and operated by InterVarsity who has been operating summer camps and year-round outdoor educational programs since 1929. We operate nine summer camps across Canada under the names of Pioneer Camp and Circle Square Ranch. Do not bring anything valuable to camp as occasionally things do get lost or broken. We reserve the right to send home any camper who fails to cooperate. 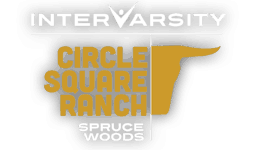 Circle Square Ranch is a NON-SMOKING facility. Please discuss this with your child prior to camp should you consider this to be a concern. The use of tobacco, alcoholic beverages, or narcotics is prohibited and will be treated as a serious offense. Appropriate disciplinary action will be taken. Circle Square Ranch is not responsible for lost, damaged or stolen items. Yes, we have a Tuck Shop that is open to the public on Saturday and Sunday during registration hours. Campers are not encouraged to keep cash in their personal belongings though, so tuck money is submitted to the camp office during registration where it is carefully recorded and safely kept. Campers make orders from their account and receive tuck purchases daily as ordered. Please note: Regular camp fees do not include tuck shop purchases, clothing and souvenirs. Registration is from 4:00 pm – 5:00 pm on Sundays except for week 6: August 6-11 which takes place on Monday, August 6, 2018. Please check your confirmation letter for precise registration timesas not all our camps run on the same schedule. We are unable to take early registrations, so it is important to verify dates and time. Some of our camps will be ending on Friday and some on Saturdays, please refer to your confirmation email/package for pick-up times. Remember to bring any important forms, as well as tuck money. A parent, guardian or a responsible adult must accompany ALL campers. ALL medications and tuck money are to be handed in at registration. If you have any questions, please contact us. Our camps for Summer 2018 will be ending on either Friday or Saturdays. Please refer to your confirmation email/package for pick up times and details. If you have any questions, please contact us. Email Your Camper: Our email address is [email protected] You may email or fax a message during your child’s week of camp but they will not be able to reply. Mail: Parents are encouraged to write letters and send nut-free parcels to their children. These may be left on registration day to ensure that your child will receive it the week they are at camp. If you mail letters or parcels through Canada Post, please send them early so that your child will receive them the week they are here. Please do not send food parcels that contain nuts. Please make sure to include camper’s full name and camp program. At Western Town, overnight there is a minimum of one counselor to 7 campers. At Teepee Village, overnight there is a minimum of one counselor to 6 campers. In each camp, campers are divided into activity groups through the day with staff members assigned to lead and give instruction along with travel group leaders. For daily activities, the ratio is 2 leaders plus an instructor for 15-20 campers. Should your child have severe food allergies, please contact us at least one week ahead of arrival at the ranch to help us with menu planning. This will allow us to prepare appropriately to ensure your child has an enjoyable stay at camp. If a special diet is required for reasons other than medical needs (i.e. vegetarian), you will be required to provide specialties. Circle Square Ranch will make every effort to accommodate allergies; however, we cannot guarantee that there will be no trace of an allergen in food served. We strive to be a nut free facility and do not knowingly serve foods containing nuts. We sell only nut free products in our store. In the interest of protecting your children, please note that all campers will undergo a lice check on the day of registration. Parents are required to stay until this has been done. If any evidence of infestation is found, the child will be sent home for treatment, nit removal & laundering of bedding/pillows before returning. Please inspect your children the day before to ensure they are lice/nit-free. Fee does not include transportation to and from the ranch or tuck shop purchases. Financial assistance is available but is limited and for those who qualify. Assistance is at the discretion of the Director. Contact the office at 204.723.2669 for information.